Oligarchs, gangsters and separatists from the North Caucasus seemed to have appeared from nowhere, however the three most popular Soviet comedies dealt with those three issues. To people who grew up in the Soviet Union and the safe, predictable and drab environment of the 1970s and ’80s, the Russia that emerged when communism collapsed was a complete surprise. Oligarchs, gangsters and separatists from the North Caucasus seemed to have appeared from nowhere, and over the past 20 years they have dominated the country. What is remarkable, however, is that the three most popular Soviet films of the late 1960s and the early ’70s — comedies made during the Golden Age of the Soviet Union — dealt with those three issues. All three were viewed by millions and are still shown regularly on television. Several generations grew up repeating catchphrases from those films, even though few even realize where they came from. “Kavkazskaya Plennitsa” (“Prisoner of the Caucasus”) is set in a North Caucasus republic — Dagestan or even Chechnya. The action hinges on a local official staging a kidnapping of a young woman. It is all fun and games, and the film gets much comic mileage out of the locals’ accents and quaint customs. But you get an eerie feeling watching this film after two decades of bloodletting in the region and devastating terrorism in European Russia. Then there was “Brilliantovaya Ruka” (“The Diamond Arm”), another extremely popular comedy. Its ostensible subject is jewelry smuggling, and it has the look and feel of an Italian or French comedy from the same era. But it also features an underground millionaire who, not surprisingly, runs the local mafia. 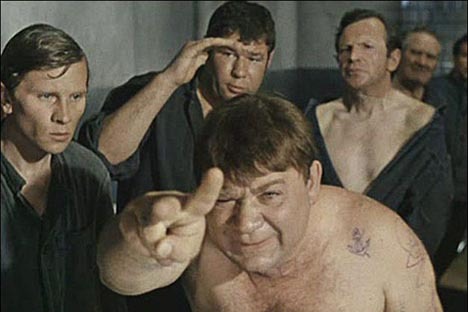 Finally, the most prescient film of the bunch was “Dzhentlmeny Udachi” (“Gentlemen of Fortune”). It starred brilliant actor Yevgeny Leonov in a double role as a sweet, innocent preschool teacher who turns out to be a dead ringer for a nasty career criminal. To help them find a stolen object, the police ask the teacher to impersonate the criminal. The thugs in the comedy are not especially scary, prisons are full of comical misfits, and thieves are unhappy marginalized men, yearning secretly to return to normal life. But there are some poignant moments as well. For example, one of the criminals, it turns out, grew up in an orphanage. In 1971, when the film was made, the social crisis in the Soviet Union was only just beginning. Over the next two decades, orphanages around the country would be filled with unwanted children, as well as kids taken from broken families and abusive parents. It is a situation that persists to this day, and often, graduates of those orphanages go on to homelessness, unemployment and eventually prison. Actually, the whole premise of the film is telling. An ordinary nerd-next-door Soviet citizen not only looks just like a career criminal, but the two are interchangeable. Or at least the preschool teacher can believably transform himself into a crime boss. In all three films, the bad guys are eventually caught and removed from the scene by honest, highly competent policemen. With such police, society has nothing to fear. That, of course, was the greatest delusion of all.